In the first grade, English Language Arts (ELA) lessons focus on the use of personal and possessive pronouns, past, present, and future verbs, descriptive adjectives, and how to annotate text. The texts used to support building these skills for the current unit have also been carefully selected to include courageous individuals from our nation’s history. Throughout assigned reading, individuals such as Harriet Tubman and Fredrick Douglas serve as examples for scholars to build their own understanding of what it means to be courageous. The “Courageous Kids” unit is full of opportunities for scholars to hone their ELA skills, build vocabulary, and become stronger writers, but it’s also a unit that teaches life lessons. In the real world, it can take courage to be kind – especially if you are faced with someone who is unkind. It can take courage to share your opinion, or listen to and respect someone else’s. It can take courage to empathize with another person’s situation and look outside of your point of view. In scholars’ everyday lives they will face moments where courage will be necessary. From applying to their dream college to introducing themselves to a new person. Understanding the concept of courage is another piece to the puzzle of preparing our scholars for the world beyond. 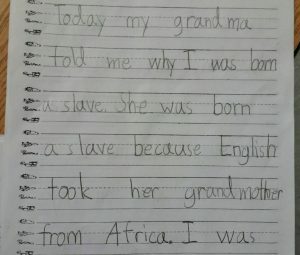 A journal entry written by a first-grade scholar at Elementary School 2. Our scholars will need courage for so many of the things they will encounter in their lives. It is our hope, that by building opportunities for our scholars to examine and think deeply about being courageous that they will find it within themselves when they need it most.